A very serious pest of daylilies which causes the buds to swell up and drop off before flowering. It can cause severe loss of flowers. This pest can be spread from one place to another in soil or potting mix with plants and also with budded scapes. The cause is Contarinia quinquenotata, a small fly which has been a pest of daylilies in Europe for several decades and was identified in British Columbia, Canada in the Summer of 2001. Since then it has crossed the border into the state of Washington and has recently been reported by AHS members in north-western Ontario and in Nova Scotia. It is quite possibly in other unrecorded locations as well. Daylilies purchased unwashed with soil, in pots, or with intact budded scapes are more likely to introduce the pest to a new area than daylilies acquired bare-root and without visible scapes. The fly lays eggs in the flower buds. 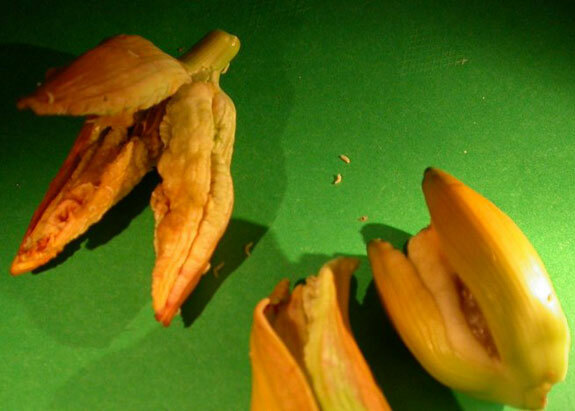 Maggots develop inside daylily flower buds causing them to become inflated, distorted and unable to open properly. Some buds may rot or dry up. 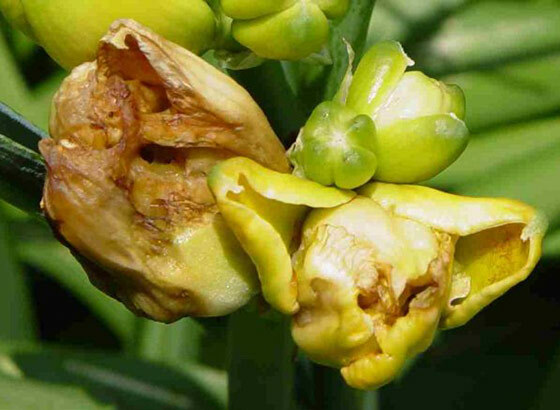 Reports indicate that in some cases clumps may be so badly affected that few buds open normally. 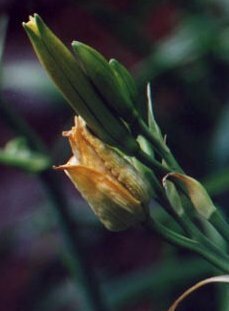 Early flowering daylilies are typically the most heavily infested and egg-laying may have ceased by the time later flowering daylilies are forming buds, allowing them to escape much of the damage. Infested buds may contain from one or two to as much as a hundred or more small white legless larvae up to around 0.12” (3 mm.) in length which, when sufficiently mature, fall to the ground where they overwinter. Thus far it appears this insect only has one generation each year. In spring they emerge as adults and fly to daylily buds to lay their eggs. Because they are inside the galled buds, larvae are protected from contact insecticides. Also, since the adults are flying for several weeks each season, it will be difficult to provide sufficiently continuous contact insecticide coverage to prevent egg-laying. Treatment involves removing affected buds as soon as it is obvious that they have been attacked. These buds must then be destroyed so that the maggots within them cannot continue their life cycle. 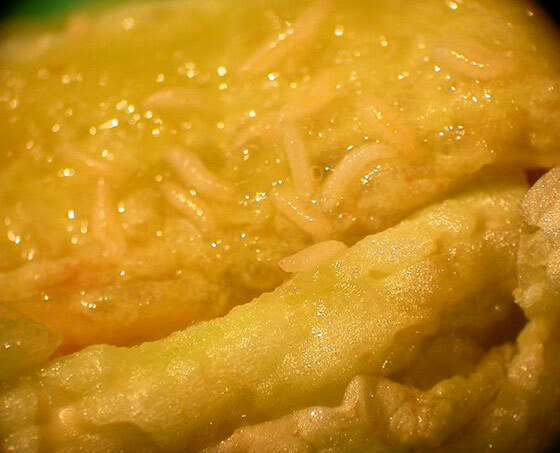 Some gardeners destroy the maggots by burning the infested buds. Do not compost infested buds unless the larvae have already been killed by some means. 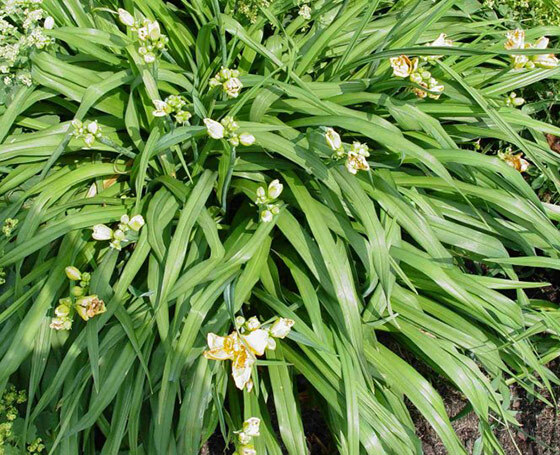 Some gardeners use early flowering daylily cultivars particularly favored by the midges as “trap plants” to assist in collection of infested buds. To avoid bringing this pest into your locality, purchase plants bare-root and well-washed. Cut off all scapes before transporting, even if they do not appear to be obviously affected. Badly affected clump with most buds unable to open. Image by Francois Verhaert, used with permission. 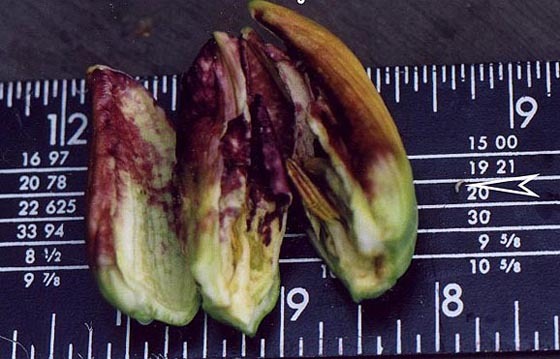 This image shows an affected bud starting to rot. 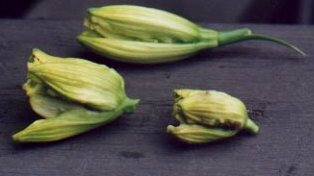 Image shows affected buds and larvae. Image by Vincent Alvarez – WSU Whatcom County Extension, used with permission. Gall Midge larvae feeding inside daylily bud. Normal bud above, two affected buds below. Photo by Jay Rowland, submitted by Pam Erickson, used with permission. Affected bud beside two normal buds. Affected bud, maggot indicated by arrow. Close-up of affected bud with maggot indicated by arrow. 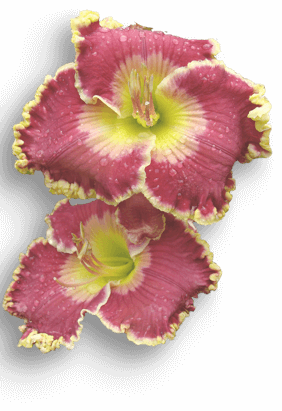 Additional information from the Royal Horticultural Society is available here. Pesticide research report from RHS/AHS study available here.